Antarctic krill is a tiny crustacean that swims in the pristine waters of Antarctica. Both your pet food brand and the pets you feed can benefit from this functional marine ingredient in multiple ways. We have summarized the 5 key benefits for you in this blog post. One of the challenges that many premium pet food brands face is to find an ingredient that will make their product stand out. The industry must increasingly cater to the needs of an audience that is willing to buy only the very best product for their pets. High quality krill meal is produced in a human-grade production facility which guarantees the best benefits for pets and humans alike. Sourcing marine ingredients from a supplier that values sustainability has become very important for many pet brand owners. More than ever, consumers and businesses alike care about the health of our oceans. Fishery in the Antarctic ocean is strongly regulated by catch quotas set by CCMLAR (Commission for the Conservation of Antarctic Marine Living Resources). You should nevertheless ensure that the krill ingredient is certified by the MSC (Marine Stewardship Council). The MSC certification ensures that the krill ingredient's entire supply chain can be traced back to the location it originates from. You can therefore let your customers be part of the entire journey of this unique ingredient. Read more: What is sustainable fishery? Every pet food formula contains fats, which ideally consists of a balanced combination of omega-6s and omega-3s. There are several sources available that can be added to provide pets with essential omega-3 fatty acids. However, most omega-3 sources come in form of triglycerides. If you tried adding such an omega-3 oil to a glass of water then the oil would float on top of the glass, because triglyceride omega-3s as do not dissolve easily. In comparison, most of the omega-3s in Antarctic krill are bound to phospholipids. Unlike triglycerides, phospholipids are water-soluble. This distinctive benefit of phospholipid omega-3s makes them gentle on the pet’s stomach and are also more rapidly taken up in the pet’s cells. This allows the pet to take full advantage of the health benefits of these essential fatty acids. Another vital aspect of creating a pet food formula is to ensure that the pets actually like the taste of the product. Just like humans, some pets are fussy eaters, and this worries many pet owners. Pet parents want to offer a healthy meal to their furry family members as well as provide them with a meal that they will enjoy. The highly palatable marine proteins that are included in Antarctic dried krill meal is the preferred choice by many dogs. In an experiment, 9 out of 10 dogs preferred the food that included a high quality Antarctic krill ingredient. 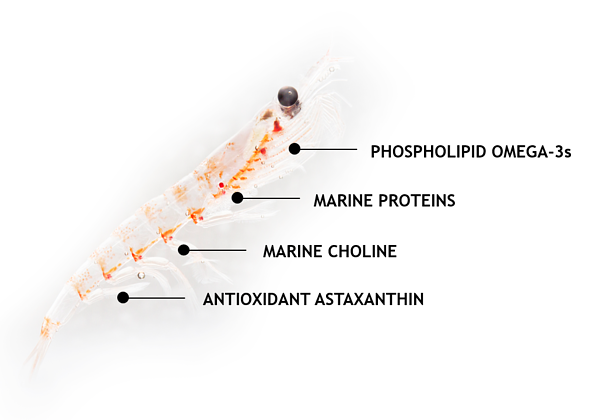 While many of the nutritional needs in pet food have to be sourced through different ingredients, Antarctic krill offers multiple qualities. One of these is choline, which is essential for a healthy liver and important for brain health. Another is the antioxidant astaxanthin. Astaxanthin is known as a natural protectant, and just like Vitamin E, it also helps to boost a pet’s immune system.